I woke up this morning and saw a barrage of current news topics flooding my iPhone feed. I had made the enormous mistake of letting the news app know what kind of stories I was interested in. I quickly realized that reading these stories was going to do two things; make me mad at the government, and force me to realize that there’s not much I can do to combat the evils of this world. Now the former I can easily dismiss as I am a conscientious voter who is informed and active at both the local and national levels. The problems of the world that we are buried with all day every day are much harder to dismiss. I often think in those moments “would it be better to go to the old days”. One of the many reasons for the letters that comprise 2/3s of the New Testament is that news was not delivered to your door. It wasn’t until 59 AD that the newspaper became an idea, and it wasn’t until 1605 that a weekly publishing of the local news stories became a reality. There was no CBS morning news while Caligula was naming his horse as consul. There wasn’t an Anderson Cooper 360 to investigate the evils of the Ptolemaic Pharaohs. News was reported by word of mouth and letters to friends. And only by speaking of these evils among those who were trusted could momentum be created to combat those evils. We are more connected than ever, whether through Facebook and Twitter, or the national news and blogs like this one. What we can’t seem to deal with anymore are the personal crises that change our emotional landscape every day. 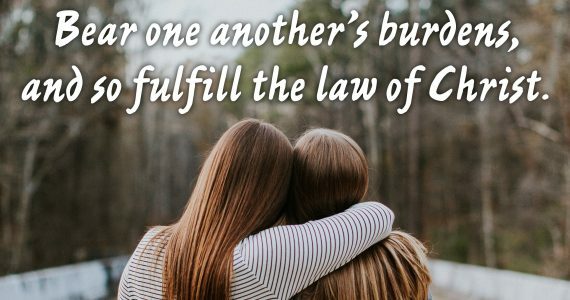 Galatians 6:2 says “Bear one another’s burdens, and thereby fulfill the law of Christ.” How often is the church gathering together to share the daily struggles? To discuss their sin issues? To honestly examine and receive counsel from their concerned neighbor? 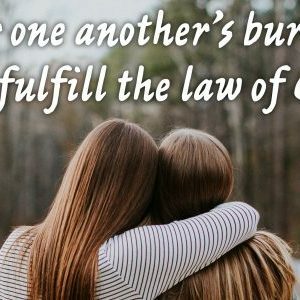 We spend so much time worrying about the condition of someone’s life 2000 miles away, but we seem to no longer hold our next door neighbor or a friend in the next pew close enough to check in on their well-being. When did “I’m blessed” become an appropriate answer to “how are you?”. All I am saying is this. Care enough about the people in front of you to ask how they are doing and be invested enough to expect a real answer. We do not minister on the surface level. We minister on the soul level. Pay attention to the news coming from the mouths of friends and neighbors. The hurts and sins that those you care for confess. Then, and only then, can you really carry a neighbors burden that is actionable.